Automatic circular seam welding machine adopts argon arc welding machine as the welding power source. The stepping motor drives the welding gun to conduct constant speed movement. The moving speed and length is set through PLC; use pneumatic pressing plate to press to ensure the stability and consistency of welding; the action program of the whole machine is controlled by PLC; use the touch screen to input data. Main Body:The main body is made of good quality steel plate. Reasonable rigid structure. 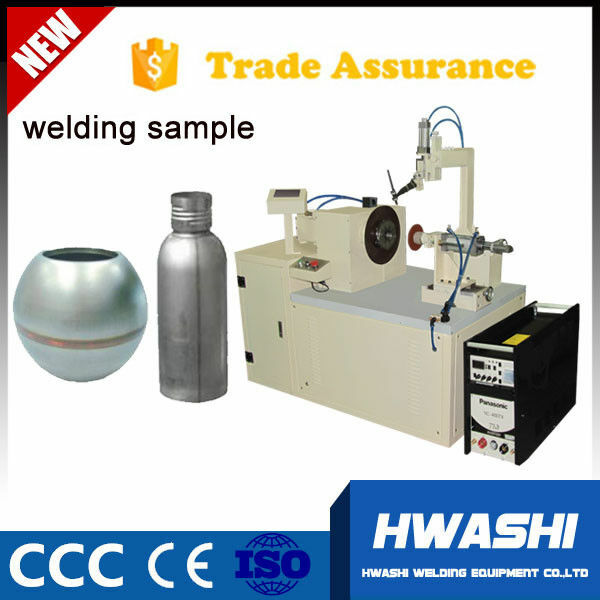 Ensure the main body has enough rigidity and stability to support the machine when conducting high speed welding. Power Source: Both the imported pulse AC and DC from “Panasonic, OTC” or argon arc welding machine from famous brand as the welding power source. The minimum thickness of sheet is 0.2mm. Pressurized structure: Adopt pneumatic components of famous brands as the pressurized source of the machine. The upper part will press down while the lower part will rise up. To ensure the reasonable machine structure and to coordinate with fast locating structure to conduct welding locating. Welding Control System: Adopt electricity and gas, coordinating with transmission mechanism to form the overall operation network. Use Japan Panasonic PLC as the central processing unit to transmit all kinds of data. Easy debugging and convenient operation. Cooling System: Adopt parallel connection embedding cooling system. Forced water cooling. Provide guarantee for high frequency and long time working.